3 is Vladimir Lyakhov’s lucky number – for the 3 Soyuz missions he flew, for the 3 space stations he stepped into, for the 3 times he left the station to walk into the icy vastness outside. Then another figure, 333 – the total number of days he spent in space. Lyakhov even has a joke about it – which doesn’t translate too well – and he tells it in thickly accented Russian, his eyes twinkling and his thining white hair gleaming under the light. Now comfortably retired, this Russian cosmonaut is here to celebrate the double anniversary of Yuri Gagarin’s journey into outer space and of his subsequent visit to Sri Lanka. 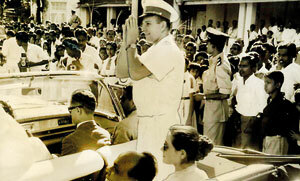 Following in Gagarin’s footsteps, Lyakhov will travel to Kandy and the spot where Gagarin planted a tree to commemorate his 1961 visit. Had Gagarin lived, perhaps this is what he would have looked like. Like Lyakhov, Gagarin was short and stocky (applicants to the space programme could be no taller than a 170 cm and 70 kg heavy), and the two men’s early careers necessarily followed a similar arc. Both trained as pilots in the Russian Air Force before they were selected to become cosmonauts, but by the time Lyakhov walked into Star City, Gagarin was already a Deputy Training Director of the facility. Despite this humble title, the first man into outer space was also something of a demi-god. Neil Armstrong had said of Gagarin, “he calls all of us to go into space,” and Lyakhov says he was happy to answer that call. 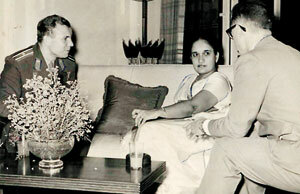 Speaking through his translator – Dr. Saman Weerasinghe – Lyakhov describes meeting Gagarin. “When he laughed, it was for the whole world,” he says, explaining that Gagarin’s winning smile made him beloved to millions. 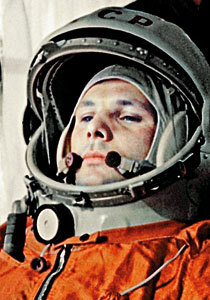 Lyakhov would train under Gagarin for a year, until a tragic plane crash in 1968 claimed Gagarin’s life. Ironically, the authorities had prevented him from returning to space in the hope that they could preserve their national hero. Instead, Gagarin’s friend, Vladimir Komarov became the first man to die in spaceflight – a whopping 203 errors were discovered in his Soyuz 1 spacecraft even before it took off and when it crashed to Earth (the parachutes being the last thing to fail), Komarov’s body was turned molten on impact. Gagarin, who would have had to make the flight had Komarov backed out, was spared that grisly fate. 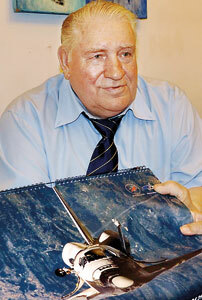 (A new book ‘Starman: The Truth Behind the Legend of Yuri Gagarin’ alleges that Komarov made his sacrifice knowingly.) That same year, the American’s lost the first of its own astronauts. They would not be the last. Fortunately, they had more to do than sit and count the passing hours. Regular tests tracked their mental and physical wellbeing as the men divided their time between observing Earth and various experiments in low gravity. Problems with spacecraft back home meant that the two had no visitors. Talking of that time, Lyakhov resists the temptation to romanticize it – trapped in the 90 cu.m that made up their living space, for months on end, with no way out and only each other for company, they wanted nothing more than to return, he says. Beneath them the Earth continued to spin – the two would see the sun rise and set approximately 3,000 times. Lyakhov grew used to seeing outlines of continents beneath him and by their sixth month he could tell exactly where the space station was positioned with a quick glimpse. Though neither Lyakhov nor Ryumin would be as famous as Gagarin, they had their own firsts to be proud of – they were the first to install a television and to transmit and receive images to and from Earth. Being able not only to speak to but to actually see their families and friends provided vital encouragement, says Lyakhov explaining that authorities believed the cosmonauts would be able to better withstand the strain of extended stays in space if they were allowed this communication. The two men are also credited with having set up the first radio telescope to orbit the Earth. In an amusing twist, they were also the first to use the station’s shower and reportedly wore scuba masks to keep the water out of their eyes. Towards the end of their stay, they were asked to take a spacewalk to free the aerial of the KRT -10 radio telescope which had become caught in the Salyut’s docking target. As a stay in outer space typically took a heavy toll on their strength, cosmonauts were rarely asked to undertake something as dangerous as a spacewalk so late in their trip. However, the two men agreed to do so. Well aware of the risk, Lyakhov describes writing a letter to his family in case he did not return. But return they did – only to find themselves as helpless as newborns. Under the heavy weight of the planet’s gravity, a weakened Lyakhov could barely lift his arms as atrophied muscles made it impossible to even stand. It would be many weeks before he recovered fully. However, he would go on to command two more missions – Soyuz T – 9 and Soyuz TM-6 – both of significantly shorter durations. Though Lyakhov does not comment on whether the risks were worth it on a personal level, he continues to be an ardent fan of space exploration. Technical advances that have given us everything from advanced communications to broadcasting and weather tracking capabilities were made possible by our willingness to step off the planet, he points out. Who knows what other leaps of understanding we will make as we venture out further? Still, would Gagarin, who had dreamed of a manned mission to Mars in his lifetime, be disappointed that his compatriots had never even set foot on the moon? Lyakhov hesitates, but then with assurance speaks of cutting edge research and simulated Mars landings currently underway in Russia – he seems confident that despite the successes and greater resources of upstarts like China and India, the Motherland is comfortably ahead in the space race. He attributes this in part to the unique outlook of his compatriots. Speaking of a time when he decided to take a spacewalk despite a damaged suit, he says it is not something that the Americans, for instance, would even consider doing – ‘they think these Russians are crazy,’ he says, grinning at his own bravado. For a moment, you see what it must have taken to invade that new frontier – that combination of blind courage, unquestioning commitment and sharp, far ranging intelligence that could propel a man and his flimsy machine into one of the most hostile environments possible…and bring him back. Having been earthbound since 1998, Lyakhov says he misses what he once had. However, he recalls that while watching the continents spin below his space station, he was filled with a desire to travel to all those distant spots on the globe. Today, with the exception of a few small islands, he has achieved his ambition of touring the world. Now, he can tick Sri Lanka off his list. For a young Sri Lankan it was a moment to treasure. 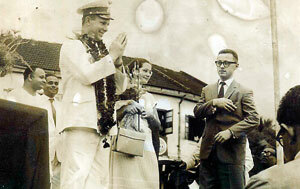 Though he was only five years old when he saw Yuri Gagarin, Prasanna A. remembers the moment clearly. 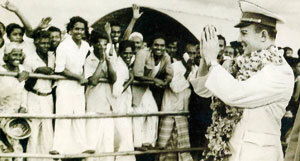 Having travelled miles with his parents and sister to catch a glimpse of the first man to travel into outer space, he stood among a crowd of thousands gathered at the site where the University of Sri Jayewardenepura now stands. Hoisted up on his father’s shoulders, he saw the cosmonaut drive by in an open car. In full dress uniform with medals gleaming on his chest, Gagarin was in high spirits, waving and smiling at the madly cheering crowd. Those were exciting decades for space exploration enthusiasts. He was so inspired by Gagarin, says Prasanna, that eight years later he braved even larger crowds to get a look at the moon rock, when it too toured the world. Tags: Gagarin, International Space Station, Russian Air Force, Valery Ryumin, Vladimir Lyakhov, Yuri Gagarin. Bookmark the permalink.